4 acrylic rectangular blocks are placed so that each of their inside corners are touching. Each one is made up of 26 sheets of acrylic fused together. Each sheet has a photographic panorama printed on it – a composite image of the gallery wall it is placed in front of – each panorama recording an array of consecutive moments in the walls temporal existence. The second part of the title, “YYZ Walls, North 20 minutes, South 24 minutes, East 26 minutes, West 26 minutes”, refers to the time it took to take all of the photographs in all of the panoramas that make up the block of a given wall. How more-past to more-present relates to the spatial coordinates of the blocks depends on from what perspective you view them. 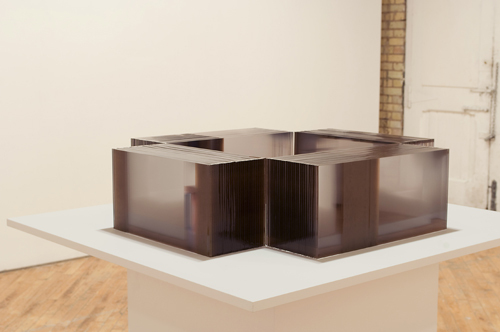 You could think of the construction formed by the four blocks as a kind of maquette of the gallery – the space in the middle of the blocks is about 1/20th the size of the gallery floor. Looking through an acrylic block towards the centre of the maquette, the acrylic sheet closest to you contains the photographic images shot furthest away in time to the present time in which you’re viewing it. From this point-of-view you are looking through the acrylic from less recent moments of the gallery wall behind you to more recent. If you were to imagine yourself standing in the middle of the maquette looking through a block to the wall it documents, you would be looking through layered records of time from the most recent past to the perpetual succession of present moments that the actual gallery wall exists in; virtual thens and real nows fusing together in a continuous all-at-once.